The NDSC Online Challenge engages participants in raising funds and awareness online. Participants use Facebook Fundraising platforms and will be awarded some really cool prizes for their efforts. We are challenging YOU to help raise awareness and funds to support the projects and programs of the NDSC such as the Rural Outreach and the Educator Conference on the Road initiatives. For information to help you get started in this social media challenge visit https://www.ndsccenter.org/wp-content/uploads/SocialButterfly-2018-Participant-Guide.pdf. Thank you to all who participated in the Fall and Winter Online Challenges. We had a great response to the campaign and several people have asked if we could continue the fun through the year. Of course, we said “YES”! We have all heard that April showers bring May flowers and in April all online challenge participants who raise $321 will receive a limited edition NDSC umbrella! Visit us again in May to see what fun prize you can earn. How to Get Started and Win Big! Here’s how you can make a difference and win prizes! Between now and year-end, hop onto your Facebook page, and create a fundraiser for the National Down Syndrome Congress (we are already in the Facebook charitable system). Tell your story and promote the campaign to all of your friends and family. Your single campaign, coupled with hundreds of other single campaigns, can add up to huge numbers and overall awareness – not only for the NDSC but for Down syndrome! Choose the time frame of your fundraiser. Facebook will send us a check! It is important to note that we do not see who donates to your fundraiser, so make sure to thank them. If you need aid in setting up your page, no problem! Email Rhonda@ndsccenter.org and she will answer any question you may have. Click here for a “how to” guide! In April, participants who raise $321 or more, will earn a limited edition NDSC umbrella! 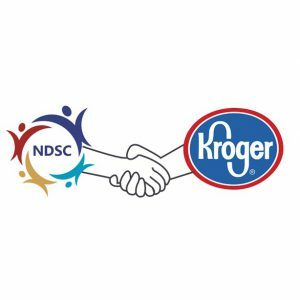 NDSC is proud of our partnership with Kroger. Sign up now and raise money all year long! It’s easy when you enroll in Kroger Community Rewards®. To get started, sign up with your Plus Card at www.KrogerCommunityRewards.com and enter National Down Syndrome Congress as the organization you wish to support. It’s that simple! Once enrolled, you’ll earn rewards for the NDSC every time you shop and use your Plus Card.